Both displays are extremely heavy: it takes four people and a dolly to move them comfortably. They were suspended from the ceiling at their respective gates in the airport; each one has a pair of vertical, tubular stanchions with threaded ends. Fortunately when we picked them up they all still had washers and nuts. The fascias are comprised of many smaller sections of black paneling that clip into place, presumably for ease of access and servicing. 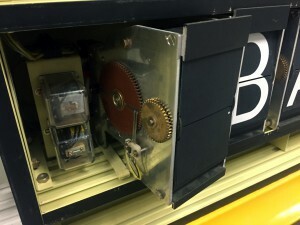 When removed, these reveal several compartments: a small section, bottom left, with four bulbs to backlight the gate number, plus space for the wiring loom, 3-4 PCBs, and eight Solaris. Don’s initial assessment is that everything was based on contemporary telephone technology. The Solari units can easily be removed by hand, one by one; on the reverse they have one six-pin plug and a longer pin for safe alignment. The fibreglass yellow ‘jackets’ are purely decorative, and can be removed in two halves (front and back) via screws at the sides. They both show signs of wear-and-tear, particularly some streaks of latex paint on the top edges. – figure out better stability, and options for shipping. 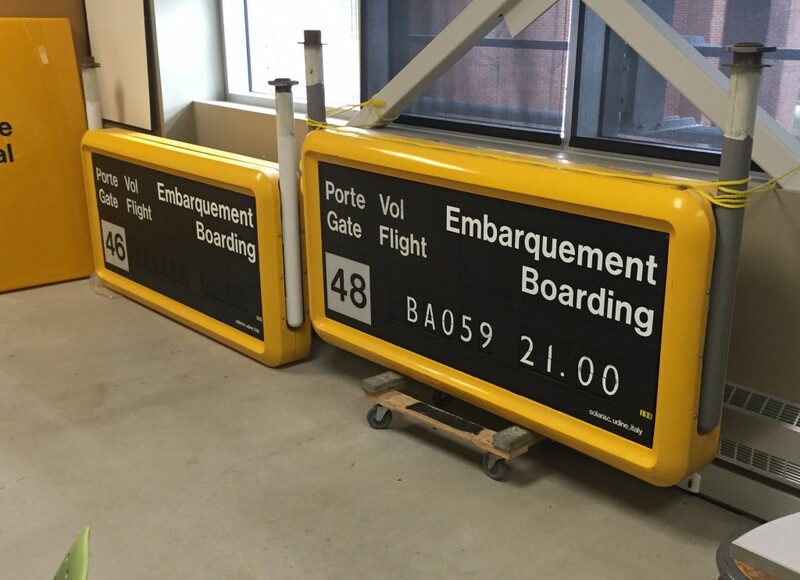 In October 2014 and February 2016 I acquired two very large ‘Solari boards’ (aka ‘split-flap’ information displays) from the soon-to-be demolished Montréal-Mirabel International Airport passenger terminal (IATA code YMX), courtesy of Aéroports de Montréal. As part of the ongoing Montreal Signs Project at Concordia University, the signs will soon become operational again, using one or more microcontrollers (eg Arduinos). I will be working with a Québecois/e poet or electronic literature artist to develop and perform a new work conceived specifically for the displays. 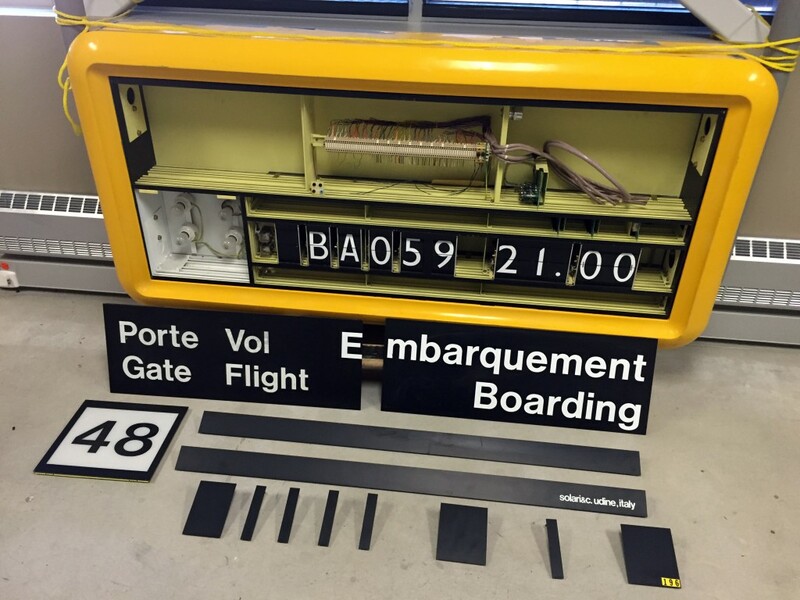 The art installation will explore issues relating to migration, modernity, time, mass transit, and ‘liminality’, ie airport departure gates as ‘edge’ spaces that are neither ‘here’ nor ‘there’. By cueing up coded, allusive phrases, flight codes, and times, and having them run cyclically, the installation will thereby put users (‘travelers’) in direct ‘conversation’ with a residual sign technology that is generally associated with anonymous, hidden control centres. 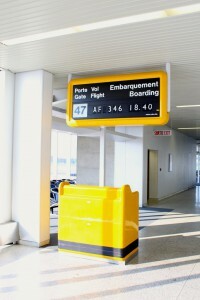 The signs will also be Internet-enabled, so we can text or Tweet to the displays remotely – thereby teasing apart the relationships between anonymity, authority, and authorship, via social media. This site is a public record of the work done to get two large airport Solari boards going again, beginning in Fall 2015. We hope it's useful to other folks who are lucky enough to encounter these remarkable electromechanical objects. The technology behind Solaris is elegant, visually and aurally distinctive, and - by today's standards - positively prehistoric. What's not to love? With thanks (so far!) to: Aéroports de Montréal; Mark Demers (Spikenzie Labs); Keith Daniel; Danica Evering (RA); Katie Hill (RA); Steve Smith (research); Giuliana Cucinelli & Nancy Marrelli (partners in crime); and, our amazing tech staff, specifically: Doug Hollingworth; Don Dolan; Phil Coté; and, Richard Allix.